After being caught cheating on his wife, one husband decided the only way to win her trust back was to get a really strange tattoo. 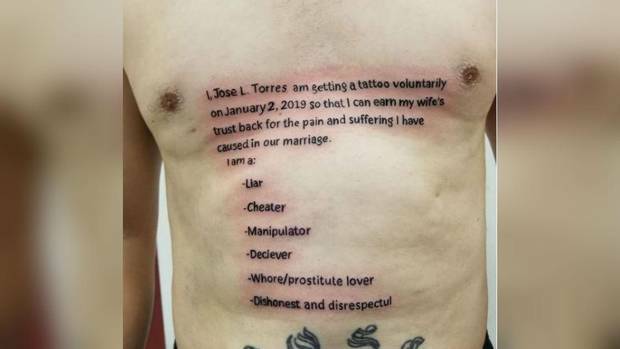 Jose L. Torres decided the best way to apologise for his betrayal was to get a huge tattoo on his torso that would be a constant reminder to both him and his wife of his infidelity. The huge tattoo goes from his chest to just above his belly button and was put there to “earn his wife’s trust back”. To make the situation even more ridiculous the words “deciever” and “disrespectful” are both spelled incorrectly. Hope it’s removeable if it doesn’t work. Probably best he leaves it on if it doesn’t work. If they can’t work out he’s an idiot when they meet him it’s a good thing for them discover it at least before they jump in the sack with him. he left off…’wanker’ and publicity hound’. Bugger!!! NZ was hotter twenty years ago. Climate Alarmists devastated, repenting, walking the streets of Progressive Welly beating their chests in sack cloth and ashes wailing “The End is Not Nigh”. Does seem strange that NIWA refer to 2018 ‘weather’ events as climate? Climate is a word reserved for events over a 30 year period. Well, I wouldn’t go as far as 30 years, but climate to me is inclusive. A hot or cold climate, that sort of thing – I wouldn’t describe events as ‘climate’ but as weather. Doing the time warp are we….? That’s cute. They’ve changed the article since they first put it up and it said 1998 was the warmest. It is always hard to keep up with the Alarmists’ adjustments to history. Not much in it anyway is there? An item on 1ewes at 6 tonight. I think it’s a good idea. Some dodgy characters and rich pricks or members of professions seem to get name suppression at the drop of a hat. And that seems often just to prevent them being embarrassed.